KO PROPO Mini-Z EX-10 Eurus Transmitter 2.4GHz ASF SS - Replaced by KOP-8041. The EX-10 Eurus 4-channel radio features some of the same classic features as the Helios series radio, but its new CPU processor allows for speeds that are faster and incorporates the new DDS (Direct Digital System). The ease of navigation with the new menu system allows for you to jump into either Model Selection, Steering Functions, Throttle Functions or operational settings. 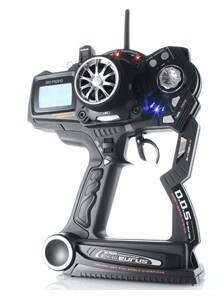 Other new features include 40 model memory, channel mixing, 2-5 position for the 3rd & 4th channels, dual rate override, neutral brake setting, 3-D trigger for more comfort, new lower profile harder steering sponge, decrease angle spacer for steering mechanical throw adjustment, new steering rocker system for smooth steering action, module recognition and more. The EX-10 Helios took the transmitter functionality to new heights with comfort and PC integration, but the EX-10 Eurus brings the new era of the direct digital system to you with more ergonomics and functionality. EX-10 Helios options will work with the EX-10 Eurus. 3D Adjustable Trigger: KO's 3D trigger innovation allows for moving the brake trigger. Fingers of different sizes and operation now have more comfort. New Menu for Easier Navigation: The new software allows for you to jump into the model menu, steering, throttle or operation functions quickly with trying to remember the order of where the function is placed in the software. New Steering Foam & Rocker System: The new low profile steering foam and new steering rocker system adds better comfort and feeling. Points Earn 364 points when you buy this product!